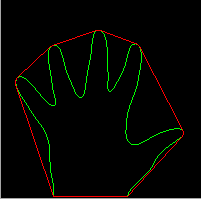 This python script can be used to analyse hand gestures by contour detection and convex hull of palm region using OpenCV, a library used for computer vision processes. 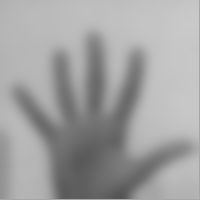 Our ROI is the the hand region, so we capture the images of the hand and convert them to grayscale. We convert an image from RGB to grayscale and then to binary in order to find the ROI i.e. the portion of the image we are further interested for image processing. By doing this our decision becomes binary: “yes the pixel is of interest” or “no the pixel is not of interest”. I’ve used Gaussian Blurring on the original image. We blur the image for smoothing and to reduce noise and details from the image. We are not interested in the details of the image but in the shape of the object to track. By blurring, we create smooth transition from one color to another and reduce the edge content. We use thresholding for image segmentation, to create binary images from grayscale images. In very basic terms, thresholding is like a Low Pass Filter by allowing only particular color ranges to be highlighted as white while the other colors are suppressed by showing them as black. I’ve used Otsu’s Binarization method. In this method, OpenCV automatically calculates/approximates the threshold value of a bimodal image from its image histogram. But for optimal results, we may need a clear background in front of the webcam which sometimes may not be possible. We now find the convex points and the defect points. The convex points are generally, the tip of the fingers. But there are other convex point too. So, we find convexity defects, which is the deepest point of deviation on the contour. By this we can find the number of fingers extended and then we can perform different functions according to the number of fingers extended. Thanks a lot for the code …how to change the rectangle size so that whole image is covered under the box ?? You mean the dimensions of the square where I place my hand ? I've specified the dimensions myself, you can change as per your need. The problem is that I am using Otsu's Binarization method for thresholding the palm region so I need minimum interference because of the surrounding colors. Therefore, I've used small square large enough to contain a hand gesture. Hello sir this is amazing but background is affecting on it. how we can make that it only detect the hand??? Hi. Apologies for the late reply but I don't know why this error is coming. Can you please post the full Traceback ? Im working on my project finger recognition with raspberry pi and python. I already try your given code. And its work without error. But, nothing appear. Camera not functioning. Video not opening. No detection. Or i need press a key or what? It is strange that it is giving this error. Can you post the code you are using and the complete error ? Maybe via pastebin or something similar. Hello Sir, I am facing the same problem? Did you find a solution? The thresholding technique which I've used here (Otsu's Binarization method) may give some erroneous results for non uniform background. You should try it in front of some clean uniform background. I have been trying the same on Raspberry Pi. I changed the code a little bit but I am getting an error that says out of resources(other than memory) or incorrect buffer length for resolution.. Kindly help me out. How can we exit the output window. In this code how can we display the number of the counts of the fingers. -which window library should i use to control mouse movements. -can u suggest some ways for background substraction so only the hand can be captured. Hello. 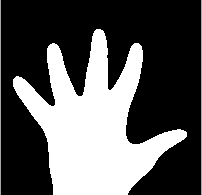 My project is hand gesture recognition for sign language. Is it possible to change the gesture classification process? I need to use earth mover's distance algorithm for template matching. Thanks. how to increase size of the rectangle widow i didnt get that please help me you can just send me a mail at gurudattbushan@gmail.com please its very urgent. hey can you provide me with your source paper if there is any? 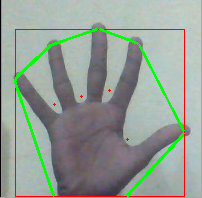 Hello Sir, My project is hand gesture recognition for drawing a shapes and fill with selected colors using python and opencv. can you share the source code at suchita.mca@gmail.com ??? Hello Vipul, I'm trying to build a system where i can recognize where my finger is pointing, Can you guide me as to how can i do that. Actually I am new to machine learning.I wanted to know how do you take any training data in your program. I’m a graduate student and I want work on hand gesture recognition for presentation of classwork. please send opencv code to my email.